Ok so you’ve introduced your children to the wonders of skiing. You’ve done a week’s family holiday in a ski resort. You’ve rekindled your love for skiing and your children are showing signs of getting hooked on the activity too. So what next? The UK, of course, has a lack of snowy mountains and unless you live in Scotland you’ll face a long journey to get to the ones we do have. Sounds like it is time to track down your local dry ski slope or indoor snow centre, and get your children signed up to one of the ski racing clubs that train on the Dendix or manufactured snow at these slopes. There are dry slopes dotted all over the UK. From down in Plymouth and Folkestone, right up to Carlisle and Aberdeen. And then there are indoor centres in places such as Hemel Hempstead and Castleford. You can take your own kit or borrow skis and boots from the slopes. I’m sure you’re asking why bother? Well being able to ride the same chairlifts and ski down the same runs as a family, and being able to enjoy regular holidays in the mountains as a family has so many benefits for you and your children. A lifetime of fantastic family experiences and memories await. If you only go on a family skiing holiday once a year, then your children’s progress will inevitably be slow. Going regularly to your local slope will mean they progress from snowplough to parallel turns in no time at all. Also becoming really accomplished skiers helps boost their self-esteem, enhances their social skills and develops them as confident, out-going people. Every child gets the chance to play football, rugby or netball at school. Not as many can say they have skiing as one of their strings to their bow. I know from personal experience. After a couple of family ski trips to France, our two boys Seb, 14, and Ollie, 12, became members of our local ski racing club at the Bowles dry slope in East Sussex. Every Friday night from 5.30pm they train for two hours. The club has members from the ages of six to 76, so they get to mix with a lot of different people and get technique coaching to hone their skills. “The club ethos is really based on all ages, but we try to promote young kids and bring them on. The club is friendly and it’s all about making it fun. 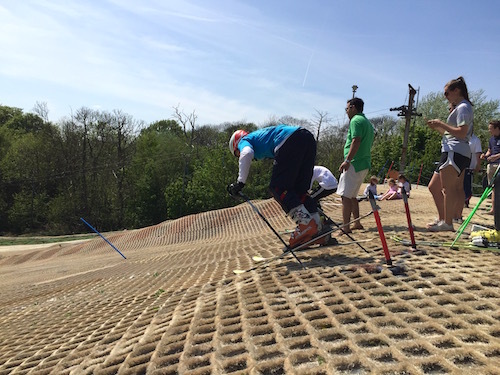 Our training includes drills, skiing gates, dual slalom practice and timed runs. It’s about making people comfortable on skis and when they transfer from the plastic onto the snow it makes them a better skier. If you can ski well on plastic, snow is much easier,” says Bowles Ski Racing Club coach Nigel Hilliard. Our club has many members who simply turn up to practice and improve their skiing. Other members decide to take their dry slope skiing to the next level. All around the country there are race series taking place throughout the year, up to regional and national competition level. 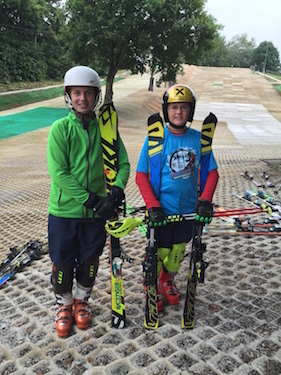 Seb and Ollie compete in slalom races in the London and South East, and Southern regions. This allows them to challenge for podium places against other skiers in their age group. It gives them a focus to their skiing all year round when they’re not on holiday with mum and dad. They love the challenge of pushing themselves and the chance of winning medals. Ski racing really accelerates a child’s learning and technique. Don’t be put off getting involved in this because you think it’s only for wannabee Lindsey Vonns or Marcel Hirschers. Your son or daughter doesn’t have to want to be an Olympic Champion to get a real buzz and boost out of ski racing. Get them involved and they will grow up to be the best skiers they can be, with a love for being on the slopes. Paul Telling is for former racer and now programme director at Team Evolution. It’s a ski race school that operates top level training out in Austria, but also runs camps at slopes in the UK to develop the sport at grassroots level. “It’s about getting as many kids as possible - who’ve been skiing with their families, who can ski to a decent level, who can ski fast around the mountain – to develop those skills. We want to get as many kids as possible into the sport, enjoying their skiing and seeing where their limits are. “The idea is to test all of the kids against as many different variables as possible. So how good are they at skiing fast? How good are they at making a short turn? How good are they at letting a ski run? What are they like skiing with one ski, or without poles? And when you take them off their skis, how dynamic are they? How athletic are they? It’s to challenge their limits in a safe environment. “If you want to get better at something then you need repetition. In the same way if you play a musical instrument you don’t just play it intensely for a few weeks of the year and then not pick it up for the rest of the year. You would actually try playing it outside of having your lessons,” says Telling. I agree and make no apology for sounding a little evangelical about this. The benefits of just a little bit of regular skiing and training on a UK slope can have a massively positive impact on your children’s ability and enjoyment. You’ll really notice the difference when you’re on snow on your next family holiday.